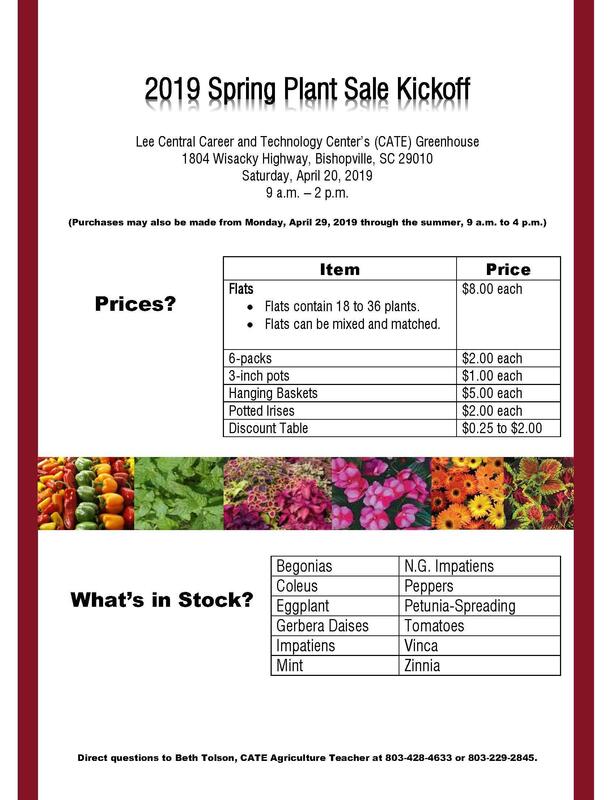 It’s time again for the Spring Plant Sale at Lee County School District’s Career and Technology Center (CATE) in Bishopville, S.C. The kickoff for sales is Saturday, April 20, 2019 from 9 a.m. to 2 p.m. at the school’s Greenhouse at 1804 Wisacky Highway. Purchases may also be made from Monday, April 29 through the summer from 9 a.m. to 4 p.m.
Plants include begonias, coleus, daises, impatiens, petunias and zinnias. For those looking for healthy food choices, eggplant, mint, peppers and tomatoes will also be sold. Prices range from 25 cent individual plants to $8 flats that contain from 18 to 36 plants. For additional information, contact CATE Agriculture Teacher Beth Tolson at 803-428-4633 or 803-229-2845.